It seems a little early for another soup post but then I am eating a lot of the stuff these nippy winter days. Especially for lunch. The following has recently been my favourite soup to make on a Sunday afternoon and to see me through the weekday lunches in the staffroom. It’s not fancy but it’s nutritious and tasty and I usually have all of the ingredients ready and waiting in my cupboards. This is my submission for the new blogging event, No Croutons Necessary, hosted by Holler and Lisa. Gently soften the onion and celery in a little oil in a medium pan. Add the garlic and spices and fry for 2 minutes more. Stir in the carrots and lentils. Add a litre of the stock to cover the veg and lentils. Bring to boil, reduce heat and simmer until the lentils are soft (approximately 25 minutes) adding extra stock if necessary. Season carefully and serve topped with fresh coriander leaves. Wendy, you have some hearty, smoky spices to counter the carrot’s sweetness. There’s never enough soup in the winter. As all of your soups do, this looks great! And what I love about it is I usually have all of those ingredients in my pantry! I am all for those types of dishes! Yum! Hi Wendy! Can you believe it if I tell you that I’ve never had red lentils before! But I know that lentils are great with fresh coriander and bay leaves. Yum! My favorite lentil soup is a green lentil soup cooked in a vegetable broth, coconut milk and warm spices, like cloves, turmeric, cinnamon, cardamom…I get never tired of it! Hi, this is my kind of soup in the winter. Love your blog. Thanks so much for your yummy entry. We’ve been getting a lot of lentil soup recipes. The more the merrier I say! Deb – Yeah, maybe that’s why this is the soup I make most often. Lisa – They may just be my favourite kind of soup. Maybe. You know, it’s recipes like this that I love. Things that people make all the time. Will be making it tonight – reckon the boys will love it (they are, as the younger one Oscar says, ‘The lentil freaks’…what have I created, I ask?!). You got my attention with lentils, but the fresh coriander leaves really sold me! I love the addition of coriander seed here. You know, I think coriander seed is used alone too infrequently. Lately, I haven’t been able to get enough of its lemony sweetness. This sounds like a wonderful winter soup. Lucy – Hope you and the lentil freaks enjoyed it! Christina – Coriander and cumin are the two dried herbs I rely on most in the kitchen. Love them! sounds simple and totally delicious. may have to search for red lentils at the import store, but I want to try this. it’s been so cold lately that soup sounds great. Yum! That looks so delicious. I wish I could scoop some out of the bowl from where I am sitting. It looks so comforting and just perfect for a chilly night like tonight. Thank you for another great recipe! Sophie – Too true, too true. Nothing wrong with simple soups, this one is a belter, cumin and carrot, perfect! Annemarie – I’ve done that several times with the very same lentils! David – Thanks! Totally agree – the more soups the better. Wendy, a tip from my father and it works (in Scotland). Bring the soup to the boil, switch off the heat and put the lid on the pot. Go back in 25 minutes and the lentils will be cooked and the soup ready. This worked every time in Scotland but not in Egypt. I think it is because the lentils are not so fine and they are very dirty too. Try my tip and let me know what you think. soup is just such a nutritious meal, isn’t it? And so darn tasty! Your soups sounds good! The cumin and coriander must have given it a great depth of flavour! for our next staffroom potluck and say it is a Scottish recipe! Well, it is from Scotland isn’t it! What a wonderful easy soup. I love it. I have tried about 4 other reciepies and yours is the only one that tastes as good as I remember. I have also cooked your chicken curry and baked gnocchi and all was so good my housemates love it all !!! Kellie – Very glad you enjoyed them all! 🙂 Thanks! Wendy – I adore your blog and love this recipe. I’ve made it dozens of times but last night was low on celery so I threw in an apple (chopped, not peeled). 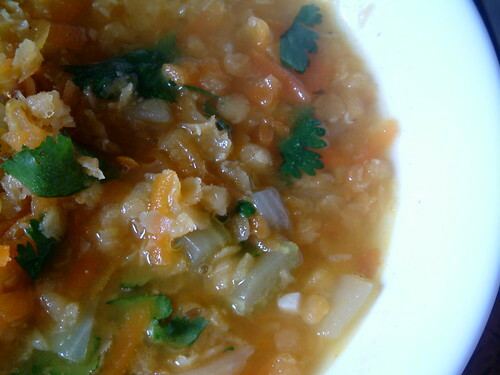 It sweetened the soups a little but adds nicely to the lentils and pops with the coriander. Worth trying 🙂 Thank you again for sharing such beautiful food. Thanks for the kind words. I’ll be trying out your apple idea this month. I’m intrigued!